China's Shenzhou VI spacecraft is not orbiting exactly as planned and will have to be restored to its original trajectory, state-run media say. The "orbit maintenance operation" would take place early on Friday morning, said official news agency Xinhua. Xinhua said resistance from the Earth's atmosphere caused the change in orbit. Shenzhou VI, which has two astronauts on board, spent a second day in orbit on Thursday, making it China's longest manned space flight. Xinhua quoted experts as saying the procedure to fix the craft's orbit would be a "normal technical operation". Nonetheless, the agency said, experts were urging all scientific and technological staff to be "cautious". Everything was functioning well aboard Shenzhou VI and it had orbited the Earth 23 times by Thursday evening, according to Xinhua. 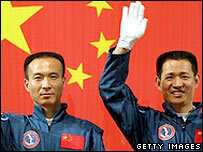 Astronauts Fei Junlong and Nie Haisheng, who is marking his 41st birthday on Thursday, were reportedly in good health. They spent the day carrying out experiments on the craft's stability. It was a unique birthday for Mr Nie, whose daughter sang Happy Birthday to him late on Wednesday. "It's marvellous around here. The Earth looks beautiful," Mr Nie told 11-year-old Tianxiang. His wife, Nie Jielin, said: "May you carry out the task entrusted to you by the motherland and return smoothly." Xinhua said that "at these words, Nie Haisheng was in tears". Washington on Wednesday congratulated China on a successful launch. US space agency Nasa also said the latest mission reaffirmed China's place, along with the US and Russia, in the space "elite". The mission is expected to see the Shenzhou VI orbit the Earth for up to five days. China's official media has speculated that the space capsule will circle the Earth up to 80 times before landing in the Chinese region of Inner Mongolia.